Chevrolet Equinox sales increased in the United States in decreased in Canada in October 2017. In the United States, Chevrolet Equinox deliveries totaled 25,272 units in October 2017, an increase of about 29 percent compared to 19,664 units sold in October 2016. The results represent the model's highest-ever October sales performance. Retail sales increased 22 percent. In the first ten months of the year, Equinox sales increased about 23 percent to 238,007 units. In Canada, Chevrolet Equinox deliveries totaled 1,622 units in October 2017, a decrease of about 2 percent compared to 1,657 units sold in October 2016. In the first ten months of the year, Equinox sales increased about 34 percent to 20,657 units. The introduction of the all-new 2018 Chevy Equinox continues to pay off, as the vehicle posted its highest October sales ever in the United States after doing the same in August and in September. The performance places the Equinox in fourth place in its segment in terms of overall sales volume. It’s worth noting that the results are in spite of the the three-week-long strike at the GM CAMI plant, which produces most Equinox units for the United States market. The walkout resulted in diminished inventories of the Equinox but it is unknown to what extent, if any, the event impacted Equinox sales in October. With the strike at the GM CAMI factory in Canada over, we expect to see Equinox deliveries continue to climb as a result of the first two reasons. The compact mainstream crossover segment grew 15.2 percent in October. During the first ten months of 2017, segment sales increased 7.71 percent to 2,297,476 units. The Chevrolet Equinox is a compact crossover. It slots above the Chevrolet Trax and below the Chevrolet Traverse. It will also be positioned below the rumored to be the future Chevrolet Blazer. The first-generation Equinox ran from the 2005-2009 model years and was based on the first-generation Theta platform. The second-generation Equinox was offered from the 2010-2017 model years and was based on the Theta 2 platform. Both the first- and second-generation models were “tweeners”, in that they straddled the compact and midsize CUV segments in size. The third-generation model was introduced for the 2018 model year. 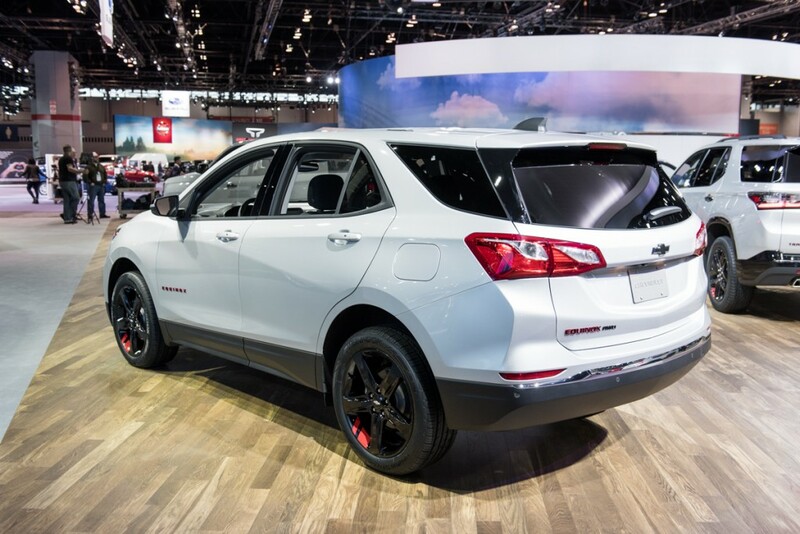 It rides on the GM D2 platform shared with the second-generation GMC Terrain, Chevrolet Cruze, and Chevrolet Volt and, unlike its two predecessors, is positioned squarely in the compact segment. The Chevrolet Equinox is built primarily at the GM CAMI factory in Ontario operated by GM Canada. Two GM Mexico facilities – GM San Luis Potosi and GM Ramos Arizpe – also share in producing the vehicle for North America. When will Chevrolet release a hybrid/EREV version? Chevy should sell a $hit load of these . About a week n a half ago my in-laws bought one , an LT model . And I finally got a chance to see it a couple of days ago and they even let me drive it . Even with the little 4 banger under the hood you couldn’t hear that ” ticking noise ” they sometimes make while seated inside . It’s AWD and feels planted to the road and for this 6’5″ frame I felt comfortable in the drivers seat . They were told that the strike in Canada slowed things down a bit and according to their salesman ” every ” car they have in Transit is already sold . Looks like a Chevy Home Run . Matter of time before Equinox surpasses CR-V, something that I never thought possible. It is a beautiful vehicle, the best looking aside from Compass and Cherokee. RAV is quality but dull!